She'll be a cut above the rest wearing the Oscar de la Renta Childrenswear Bow Front Long Sleeve Blouse. Peter Pan collar with bow at center front. Long sleeves with button cuffs and embellished trim. We can't currently find any similar items for the Bow Front Long Sleeve Blouse (Little Kids/Big Kids) by Oscar de la Renta Childrenswear. Sorry! I love this blouse. My daughter needed a white collared blouse for her orchestra event. This is perfect. I really like the detail on the wrists. 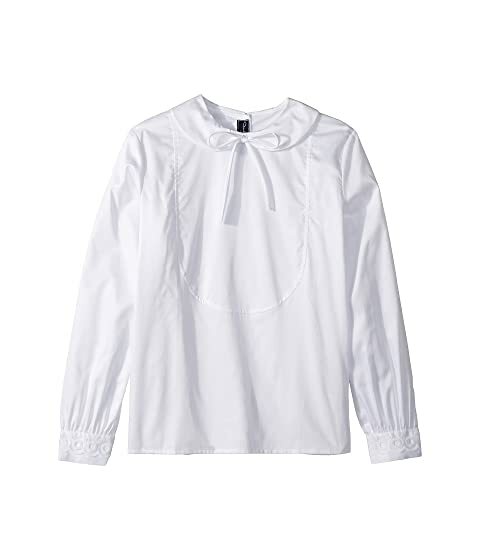 I needed to find a dressy, collared, long-sleeved white blouse for my daughter's violin performances this summer...not an easy find for a tween who has recently decided that she needs to be fashionable. This blouse is so pretty and sweet, I like the detail on the wrists. I was happy to find this on sale.